IC 342 is a spiral galaxy in the constellation Camelopardalis. It is a member of the neighboring IC 342/Maffei galaxy group. While it is the largest galaxy in its group, it is about half the size of our Milky Way galaxy. IC 342 is located about 10 degrees above our galactic plane and therefore we must observe it looking through some dense regions of our own Milky Way galaxy. Our galactic dust and gas obscures IC 342 making it appear slightly reddish brown and this dust also dims the galaxy by 2.4 magnitudes. All of the stars in my image are foreground stars and are part of the dense star field of our Milky Way galaxy. I think this provides a great field of view at the right focal length. 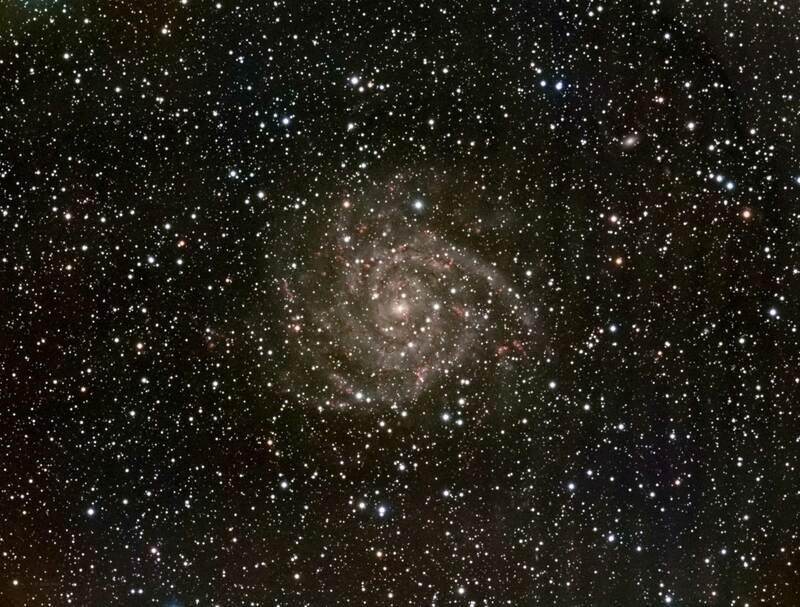 IC 342 is an SAB(rs)cd galaxy. The SAB means it is a spiral galaxy with a slight bar. The (rs) means that there is a slight ring around the core and the cd describes how tightly wound the arms are. The galaxy is rotating counter-clockwise based on the shape of the arms. The majority of the arms contain gas and dust regions which are full of very hot and very young stars. The arms also contain several HII regions which are star forming regions and can be seen as reddish blobs in my picture. The core of IC 342 is also a region of high star formation and is a popular target for research. This image was captured from my home in a Bortle 6 zone.